The Italian Grand Prix was one of the inaugural Formula One championship races back in 1950, and the Gran Premio d’Italia has been held annually every year since. This claim can be made by only one other championship race, the British Grand Prix, while the only F1 races still on the schedule from the inaugural year are the Belgian and Monaco Grands Prix. All of the Italian Grand Prix races have been run at the Autodromo Nazionale Monza, with the exception of the 1980 race held at Imola. If you’re interested in attending this year’s running of the Italian Grand Prix, our team at Jet Charter Europe can arrange for your private flight to Northern Italy. Milan is located just 20 kilometers away from the Autodromo Nazionale Monza, and we can arrange for your private flight to land at one of two airports in the city: Milan-Linate Airport (LIML, LIN), a popular landing choice for many charter flights to Northern Italy, and Milan-Malpensa Airport (LIMC, MXP), one of Europe’s 30 busiest airports. Purchase a Formula One Paddock Club ticket and treat yourself to the finest hospitality at the event. Enjoy views from above the pits while indulging clients, employees and friends with an exclusive experience they’ll never forget. VIP access to the track provides exclusive viewing areas, pit-lane walkabouts, and an open bar with champagne so everyone can enjoy the taste of victory. These private parties may include up to 70 people, with customization and branding available. 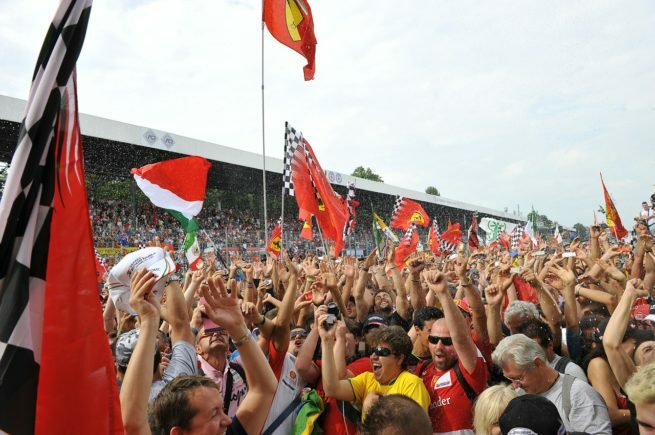 Over the decades, Monza has been the scene of some of Formula One’s most iconic moments – the emotions following Gerhard Berger’s 1988 victory for Ferrari following the death of its founder, Enzo Ferrari; Michael Schumacher announcing his retirement following an emotional 2006 victory; Sebastian Vettel became F1’s youngest race winner with his 2012 victory at Monza. Join the crowd in Monza for this year’s running of the Italian Grand Prix with a private flight to Milan! Our team utilizes the following airports to arrange private flights to/from Milan, Italy and neighboring areas. Request a Quote or give us a call at 1-888-987-5387 to speak with one of our private jet charter agents and join the crowd at the 2016 Italian Grand Prix by booking your private flight to Milan, Italy!